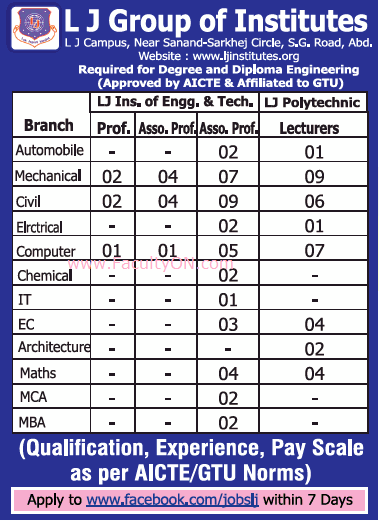 LJ Institute of Engineering and Technology, Ahmedabad has advertised for recruitment of Professor / Associate Professor / Assistant Professor / Lecturers (For LJ Polytechnic) jobs vacancies. Interested and eligible job aspirants are requested to apply within 07 days from 05th December 2018. Check out further more details below. About College : L.J. Institute of Engineering & Technology, commonly referred as LJIET, is a private technical institute located in Ahmedabad, Gujarat, India. Institute is approved by All India Council for Technical Education and is the part of L.J. Group of Institutes managed by Lok Jagruti Kendra Trust.